As a 30-something fashion editor, I thought my days of scrunchies, butterfly clips, and thick headbands were well and truly behind me—banished to a dark corner of my closet alongside my illegally short high school skirt and blazer. That was until about a month ago when the resurgence of the '80s scrunchie seen all over the runways and in the strands of my favorite fashion influencers impelled me to purchase a pretty pastel pink one. Fellow fashion editor and friend Ally Payer also twisted my arm after she took the trend for a spin. And while it's certainly not a regular attendee at work, it does happen to look super cute when thrown up in a high bun on the weekend. @joiedejude; PICTURED: Taking my pretty pastel scrunchie for a weekend spin. But it's not just scrunchies stealing the limelight. In fact, chic (and old-school) hair accessories have been making a major comeback. And the trend shows no sign of slowing down for the fall season either. The A/W 18 runways were replete with striking hair candy. From leather headbands at Tom Ford to diamante hair slides at Zadig & Voltaire, it's safe to say there's now a chic fix for every bad hair day we'll encounter this season and beyond. The Insta set has inevitably been putting trendy hair accessories on the fashion map too—tying silk scarves as headbands, fastening their ponytails with ribbons and french barrettes, and sweeping bangs back with metallic slides. Hair accessories that unquestionably look chic at every age. Ready to be inspired? Scroll below for the biggest hair accessory trends and how to wear them. From silk scarves tied as headbands to stretchy leather pieces and the return of the stretch comb, it's time to slick back your strands in one of this season's must-have accessories. Whether you call them claw clips or crocodile clips, the '90s mom hair accessory is back. On the bonus side, what was once a post-shower solution for damp hair can now be worn from work to cocktail bar. 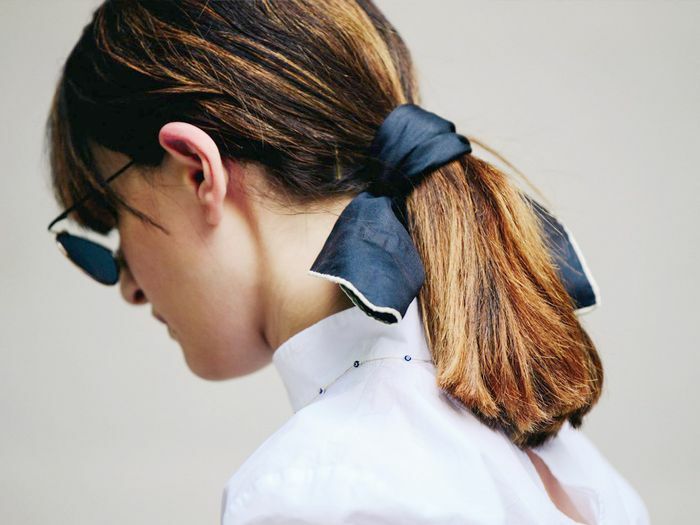 The perfect way to wear this season's hair slides and barrettes are as multiples. Opt for something sparkly, embellished, and showstopping. Silk scarves offer a chic and unique way to tie back a low ponytail in style. Opt for something understated for work or go bold and bright when you're off-duty. Max Mara sashayed models down the runway in statement metallic monogrammed hair clips, while Chanel tucked floral pearl motifs under high topknots. Trust us—it's the best remedy for a bad hair day. Three decades later and scrunchies are well and truly taking center stage again. Time to welcome your favorite childhood accessory back into your life. Up next, allow us to reintroduce you to these hair accessories.